Mary Sendek was a homeowner on Queens Boulevard who refused to sell her home to Macy’s when they wanted to build a store on her plot. She was the only one on the block who refused to sell. 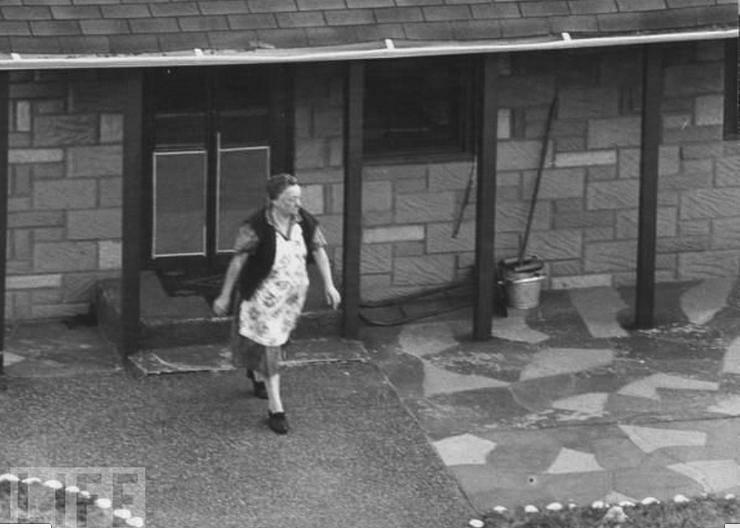 She remained in the house, next to the Macy’s that was built, until her death. The mystery will never really be solved. One neighbor told the New York Times she just wanted to start and end her life at the same place. (Although she actually bought the house when she was 24 years old). Newsday reported she refused to even sell her yard to Macy’s because her dog needed that area to run around in. Her son Victor said he didn’t want to discuss it further, that it was a private matter. I recently tried to reach the descendants of the family, no change, I got no answers from them as well. The Queens Boulevard the Sendek’s moved onto in 1922 was much more rural and narrow than the street we know today. One lane each way, sparsely lined with farmhouses, stores and churches, it looks like the country. But the Queensboro Bridge had just been completed in 1909 and the road was being transformed into the main approach from Queens to Manhattan. It was being widened into the multi-lane, multi section road we know it to be today. In order to accomodate the widening, the buildings on the south (or west) side were being demolished or relocated fifty feet to the south to make way for the new wide road. Luckily, the Sendek house was on the north side and did not have to go. The story of Mrs Sendek and her refusal to sell may have made her a local hero at the time, but up until 1965 there was really nothing unusual about her and her family. Mary and her husband Joseph were Hungarian immigrants, both families having come over around 1898.The Sendeks bought the small house on Queens Boulevard in 1922 for $4,000. They had a girl followed by four boys. Husband Joseph passed away in May 1938. The Sendek’s were members of the Old Netwown church a couple blocks up the road. Children Victor, Edward and Mary sang in the church choir and took part in pageants there. Oldest daughter Mary was the leader of local Girl Scout Troop Troop 4-375 and became a teacher at nearby PS 11 in Corona. From all we can tell they were a humble, quiet, contributing part of the community. The Sendek house was originally situated in the middle of a block of houses between Broadway and 56th Avenue, but that changed when a new road, 55th Avenue was placed right through the block. In order to build the road the three buildings to the west of the Sendek house were demolished (see the above photo). If the Sendek house had been a few more feet to the west, it might have gone too (and saved Macy’s a lot of headaches). Macy’s set its sights on the Elmhust plot between 55th and 56th avenues for a new store in the early 1960’s. It was large, open, and had fairly few houses on it. It was centrally located, just a couple blocks west of Woodhaven Boulevard. But the plot had an odd shape, particularly on its east side. William Robbins of the New York Times described it as looking ‘like a ham.’ This would make it difficult to build adequate parking for the store, so chief Architect William Brown conceived of a unique store in the round that would include the parking within the building itself. It would be 426 feet in diameter, contain six parking levels, accommodate 1,500 cars, and no parking space would be more than 75 feet away from an entrance, and every space was completely covered. Everything was ready to go until Macy’s ran into the unassuming but defiant homeowner on the corner. She refused every offer made for her land, Macy’s biggest one being at $200,000. Macy’s had no choice but to adjust its huge circular store so that it stayed out of Sendek’s air space, at a cost to them of $50.000. The Sendek plot was only 169 by 52 feet. It also cost the store its plans to put landscaped plazas on that corner, and according to planning architect Michael Keselica it had a negative effect on the way the entire building was percieved. Mrs. Sendek stayed in her house, right next to the big Macy’s for 15 years. I always wondered if she went shopping there. Mrs. Sendek died in 1980, her children then sold the house to Diplomat Enterprises who elected to destroy it and put a strip mall in its place. Maybe they should have considered moving it and keeping it as a testament to the woman who stood on her principles over monetary gain, instead it is no more. 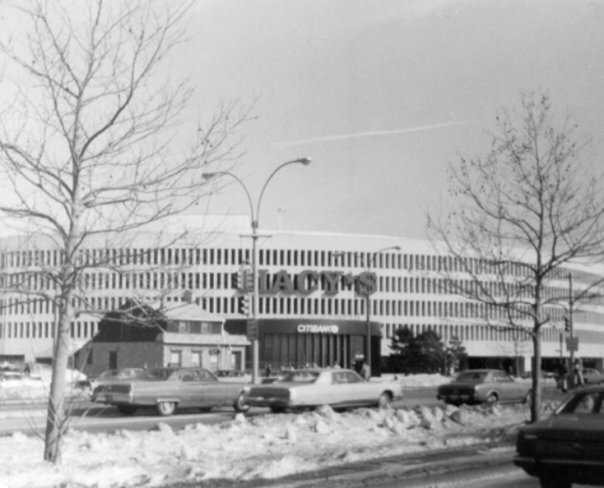 While the Macy’s design may have seemed fresh in 1965, the opening of a new mall, the Queens Center a few blocks away in 1973 seemed to age it very quickly. The new mall was bigger, more modern, more centrally located, and had more stores. 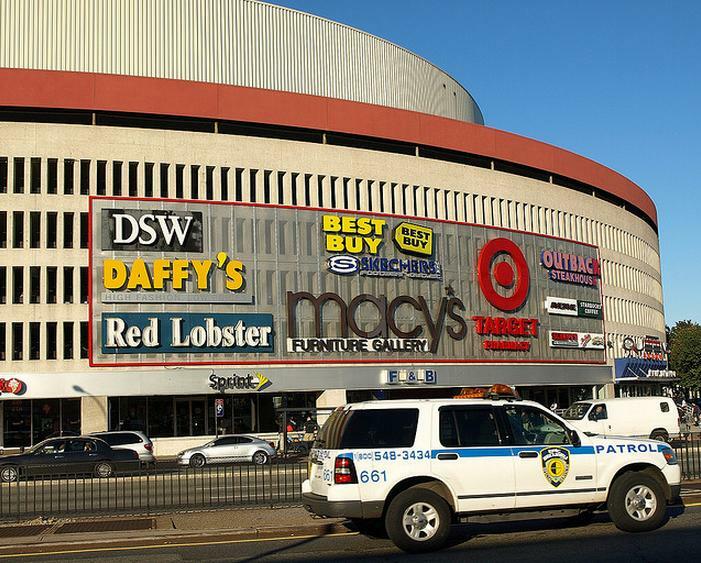 Macy’s even moved itself over to Queens center in 1996. It’s parent company tried a Stern’s store at the location but that too closed in 2000. The original Macy’s only outlasted Mrs. Sendek by 16 years. Now the building houses a number of smaller stores, including a Macy’s furniture gallery. No word if the Sendek descendants have ever shopped there. Thanks for the info! Was the house green? Because that’s what I recall. Roger, you can copy a picture and save it to your computer very easily. Place your cursor just to the right of the picture. Left click and hold as you slide the cursor over the picture till it turns blue (highlighted). Let go of the left mouse button and click the right one. A menu will open. Click on the line that says “save image as”. A box will open that will allow you to title the picture. Click “save” and a copy of the picture (jpg) will be placed in your “My Documents” folder. Open the folder… double click on the picture… and you can get a good look at it. You can save multiple pictures as long as you title them differently. You can even call them Picture 1, Picture 2, etc. If you want prints, you can copy the jpgs to a portable thumb drive or other medium and have them made anywhere (like WalMart). also… before you save the image, click on it… a larger version will appear.. you can save that one. I remember this house very well…..always thought it was strange it being there with no other houses around….we were taken to white castle and the rides as a treat…. Thanks for putting the story straight….she was a women way before her time….Don’t mess with a women scorned…… I would have been proud to know her….. Thanks again…keep up the good work…. Interesting piece of history. Thanks for this refreshing story. Great article. Growing up in Flushing and Corona, the house and its story were quite famous. I remember the wide variety of opinions amongst the grown-ups which went from praise (for standing her ground) to criticism (for being stubborn and ending up on a busy commercial intersection with no neighbors). Even as a child, however, I thought that “the lady” (Mrs. Sendek) could,or should have sold just the small corner of her backyard to Macy’s so that they wouldn’t have had to carve that notch into the facade. It’s too bad that the modest little house isn’t there anymore. It could have been Queens’ version of Hurley’s vs the Rockefeller Center on Sixth Avenue. The book “HOLDOUTS! The Buildings That Got In The Way” tells the story of this holdout problem that Macy’s had with its Queens store, and also a similar problem it had with its flagship store in Manhattan at 34th Street and Broadway, and even a third similar problem it had when it expanded at 35th Street and Seventh Avenue. That book was written and architect/attorney Andrew Alpern and real estate developer Seymour Durst. Andrew, the Lord and Taylor at 38th/39th at fifth had the same problem. They built the store around the building and bought it eventually and used it for offices. Thanks a lot for this. I am writing an article at http://LasVegasWorldNews.com about an elderly man who won’t sell his place in Las Vegas and I was referencing the Queens incident since I grew up there and couldn’t remember Mrs Sendek’s name. I remember reading that Mrs. Sendak refused to sell simply because the house was her home. She wasn’t interested in the money. As 1/2 Hungarian myself, I can state Hungarians are very stubborn and stick to their guns when they believe they are right. Mrs. Sendak believed she was right and didn’t concern herself about the big guy who wanted her property. I can well understand her feelings now and I certainly did then. I would do the same. She was David against Goliath and she did win for the rest of her time. It is truly a shame that the house was demolished in the end. It should have stood as a monument to her courage. She was a remarkable woman. I wish I had known her. It’s unimportant that the Macy building lost a piece because of her. Staying in her home was more important than Macy’s desires. That’s my husband’s grandmother. The correct spelling is Sendek, not Sendak. God rest her soul…does she have any living relatives?? Thanks for the memories! I went to high school right behind the Macy’s, and remember Mrs. Sendak’s house. I also remember the arcade (this was the late 60’s). I spotted her working in the yard every now and then; felt sorry for her being so lonely. I also remembered her house when I saw the Disney movie “Up”. About 15yrs ago there was a house in Dallas that did the same. An elderly man would not sell to a bank. They put their drive-up right next to his yard, invading his privacy IMO. I think there is something very nice about saying no to corporations, and standing your ground. I guess I can empathize with the late Mrs. Sendek for not wanting to sell her home because she did not want to move, as I know many elderly people who get set in their ways and also like to stay put and not move on to a different place as they age. Don’t get me wrong, I love my home and the town it’s in, but I would have no problem moving if I was offered an exhorbitant sum for my property, as I have lived in so many different homes and communties that I really don’t feel anchored to one particular place and have enjoyed the experience of living in the many places I have lived. The only thing I find perplexiing is given the change of the community around her, especially all the other houses that were torn down and ending up with your house as the only home left on such a busy traffic chocked multi-lane highway as Queens Boulevard came to be, how she coped with those major changes. That alone to me would seem as a catalyst for anyone wanting to relocate to a more quiet and residential area such as it once was. Good for Mary! She did what she wanted and got her way. Not many people would do this or would have had enough courage and strength. Also most have always opted for selling out! People are so easy to sell out on their home, their neighborhood and communities. Scared for what it will become but we as the community should help dictate what it will become and how to make communities better. Not every time can it be a win for a community but every bit helps. So what a little more noise and congestion where Mary lived after the Macy’s was built. She didn’t care that home is where she raised her family, laughed, cried and had memories in her home and she worked hard to have that house. For Mary it was her oasis and love! Her home was around reality and what was going on in the world. She wasn’t sheltered or far away from the real world, she was right in it! She was ahead of her time and truly a heroine and modern city girl! One of the reasons Walter O’Malley took the Dodgers from Brooklyn to Los Angeles is because of people like this. He tried to buy up all the properties around Flatbush ave LIRR railroad station where the Barkleys Center now stands but the City would not give him any help with eminent domain and Los Angeles did with Chavez Ravine. O’Malley correctly predicted that some one would block his buying of the properties. That’s quite fascinating.. The landscape is so much different now.. Too bad the house couldn’t stay..
Good story. I remember hearing about it as a kid. My parents rooted for her. To those who disagree with her staying there: Suppose a commercial developer wanted to build a shopping mall where the White House stands. We’d all say no because of it’s history and symbol of America. Well, this was her White House. It represented her history, it’s where she made her life. Great post – one question – I went to PS 11 in Woodside – would there have been another PS 11 in Corona?